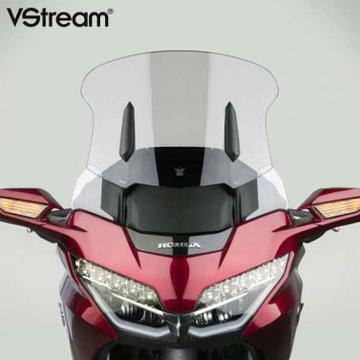 National Cycle's VStream® is revolutionizing motorcycle windscreen performance! While other manufacturers offer taller screens or air spoiler tops, National Cycle designed, for the first time ever, a windscreen with airflow calculated and adjusted to quiet and comfort the rider's environment. The typical airflow pattern of the wake from most windscreens is called a van Karman vortex. At speeds of 50-90 mph, the air swirls off the windscreen in an approximate 90-degree segment of rotation, hits the bottom of the rider's neck on the way up, and curves off the shoulder at approximately 45 degrees.We gave the VStream its name for the shape it takes at the upper edge. The patented “V” shape is so quiet because it pushes this vortex out and away from the side of the rider's head. The rider’s helmet then resides in still air, and the passenger's environment is greatly improved as well. VStream windscreens deliver unprecedented durability and optical clarity through the use of 4.5-6.0mm thick Lexan® polycarbonate with FMR hardcoating or our exclusive Quantum™ hardcoating. Nothing else comes close to matching the impact strength of polycarbonate, making it the ideal material for motorcycle windscreens. It is 10X stronger than H.I.A. and 20X more impact resistant than acrylic plastic (Lucite®). They are also 30X more scratch resistance than typical acrylic windscreens. Quantum even has 10X better scratch resistance than the FMR hardcoating used by most manufacturers!